(PhysOrg.com) -- Astronomers using ESO’s Very Large Telescope have for the first time obtained a three-dimensional view of the distribution of the innermost material expelled by a recently exploded star. The original blast was not only powerful, according to the new results. It was also more concentrated in one particular direction. This is a strong indication that the supernova must have been very turbulent, supporting the most recent computer models. Unlike the Sun, which will die rather quietly, massive stars arriving at the end of their brief life explode as supernovae, hurling out a vast quantity of material. 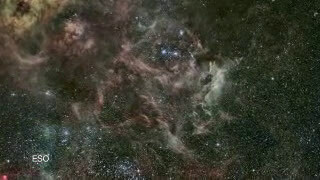 In this class, Supernova 1987A (SN 1987A) in the rather nearby Large Magellanic Cloud occupies a very special place. Seen in 1987, it was the first naked-eye supernova to be observed for 383 years, and because of its relative closeness, it has made it possible for astronomers to study the explosion of a massive star and its aftermath in more detail than ever before. It is thus no surprise that few events in modern astronomy have been met with such an enthusiastic response by scientists. SN 1987A has been a bonanza for astrophysicists. It provided several notable observational ‘firsts’, like the detection of neutrinos from the collapsing inner stellar core triggering the explosion, the localisation on archival photographic plates of the star before it exploded, the signs of an asymmetric explosion, the direct observation of the radioactive elements produced during the blast, observation of the formation of dust in the supernova, as well as the detection of circumstellar and interstellar material. 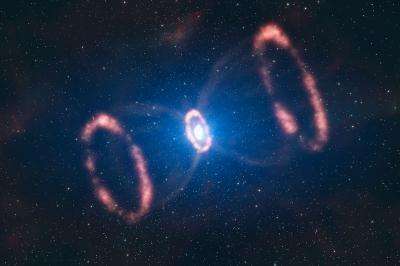 This artist’s impression of the material around a recently exploded star, known as Supernova 1987A (or SN 1987A), is based on observations which have for the first time revealed a three dimensional view of the distribution of the expelled material. 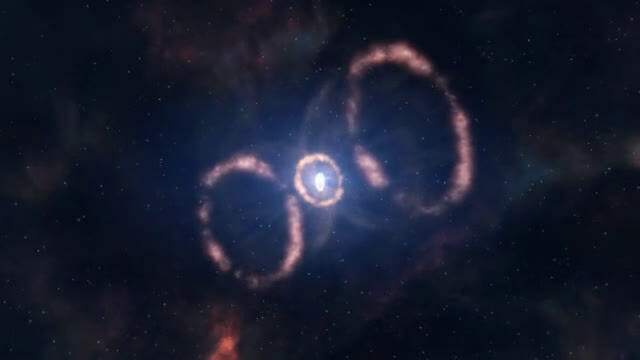 New observations making use of a unique instrument, SINFONI, on ESO’s Very Large Telescope (VLT) have provided even deeper knowledge of this amazing event, as astronomers have now been able to obtain the first-ever 3D reconstruction of the central parts of the exploding material. This view shows that the explosion was stronger and faster in some directions than others, leading to an irregular shape with some parts stretching out further into space. The first material to be ejected from the explosion travelled at an incredible 100 million km per hour, which is about a tenth of the speed of light or around 100 000 times faster than a passenger jet. Even at this breakneck speed it has taken 10 years to reach a previously existing ring of gas and dust puffed out from the dying star. The images also demonstrate that another wave of material is travelling ten times more slowly and is being heated by radioactive elements created in the explosion. Such asymmetric behaviour was predicted by some of the most recent computer models of supernovae, which found that large-scale instabilities take place during the explosion. The new observations are thus the first direct confirmation of such models. SINFONI is the leading instrument of its kind, and only the level of detail it affords allowed the team to draw their conclusions. Advanced adaptive optics systems counteracted the blurring effects of the Earth's atmosphere while a technique called integral field spectroscopy allowed the astronomers to study several parts of the supernova’s chaotic core simultaneously, leading to the build-up of the 3D image. Thanks for the beautiful images! They conform that the explosion does not homogenize the supernova debris. This is exactly what we observed in meteorites, beginning in the early 1970s ["Xenon in carbonaceous chondrites", Nature Phys. Sci. 240, 99-101 (1972); "Strange xenon, extinct superheavy elements and the solar neutrino puzzle", Science 195, 208-209 (1977); "Isotopes of tellurium, xenon and krypton in the Allende meteorite retain record of nucleosynthesis", Nature 277, 615-620 (1979)]. Meteoritics and Planetary Science 33, A97, abstract 5011 (1998)].